Quilted Northern Deal | Soft & Strong $0.45 per Double Roll! 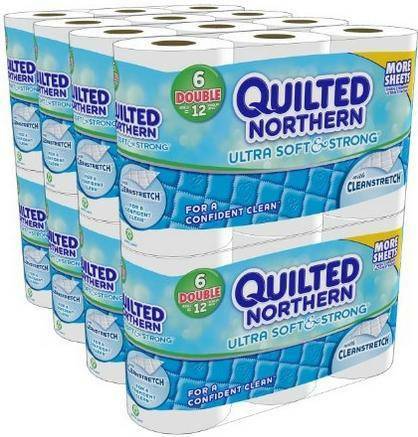 Home / Deals / Online Deals / Amazon Deals / Quilted Northern Deal | Soft & Strong $0.45 per Double Roll! There is a great Quilted Northern Deal today that you can snag for your house! Amazon has the 48 pack of Quilted Northern Soft & Strong Double Rolls for $22.74 with Subscribe and Save plus you can clip a $1 off Coupon you should see to the right of the image. That makes each double roll $0.45 which is a nice price on Quilted Northern and it ships FREE with Subscribe and Save! Les Miserables Blu-Ray Combo Pack only $11.49 + Free One Day Shipping! Love Actually Blu Ray DVD Combo Pack only $9.99!